This stunning coffee table book is filled with both thought-provoking essays and stunning photos, many of which were highlighted in a special feature in Time Magazine. Blue Planet Run provides readers with an extraordinary look at the water problems facing humanity and some of the hopeful solutions being pursued by large and small companies, by entrepreneurs and activists, and by nongovernmental organizations and foundations. By the end of the book, readers are left to form their own conclusions as to if and how the human race can solve this global crisis before it’s too late. 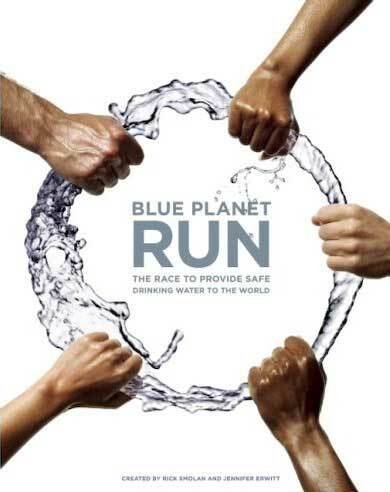 Blue Planet Run is two books in one: first, it’s about an extraordinary 15,000-mile relay race – the longest relay race in human history – in which 20 athletes spent 95 days running around the globe to spread awareness of the world’s water crisis. Second, it’s a showcase of powerful, inspiring, disturbing and hopeful images captured by leading photojournalists around the world who documented the human face of the crisis and its possible solutions. The result of these two parallel projects is the book you hold in your hands. One hundred percent of the royalties from this book will be used to provide clean water to people around the world who desperately need it.